It’s not often Fedor Emelianenko makes a public appearance stateside, particularly when a fight’s not looming. However, the planet’s former/reigning top heavyweight recently hosted a seminar in Chatsworth, California to pass along some tricks of the trade to a few fortunate fanboys. “The Last Emperor” was last seen tucking his head between Fabricio Werdum’s lanky legs for a shocking submission loss. The June defeat marked his first professional MMA blemish in nearly a decade. 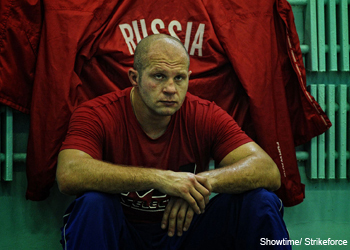 Emelianenko has only one fight remaining on his current Strikeforce deal. M-1 Global, the management company that handles all of his affairs, were hoping to have an extension ironed out by week’s end. While their intentions are appreciated, it’s highly unlikely as negotiations have lagged for several months to no avail. It’s appearing as though he could become a free agent after the next time he takes the cage.